I love books by Noel Streatfeild (Ballet shoes for Anna is a particular favourite of mine), Pamela Brown (of The Swish of the Curtain fame) and Malcolm Saville. Saville was a favourite of my Mum’s too, and I still have a couple of her old books. He started writing in the late 40s and carried on through to the 80s, and I got hooked when I was about nine. I treasure the short letter he sent me in answer to mine. Check out the Malcolm Saville Society for more information on this author. I was chuffed to bits when I won a short story competition they ran – it was great fun to write one sleepless night. I have spent quite a lot of money completing my children’s book collection or replacing particularly tatty copies. I’m not that bothered about first editions or such like, although I have been known to buy a collection again in a single edition, for aesthetic reasons – it does look nice a shelf to have uniform book sizes for a given author or series – but it was a positive duty to replace my 1970s Lone Pine collection (Malcolm Saville’s most famous series) when I discovered that these editions were an abridged version of the original books. Apparently the publishers of the day had decided that children did not read more than 190 pages… It was such a joy to read what was “bonus material” for me, basically lots of extra lovely descriptions and character development. 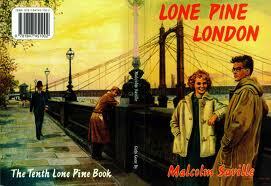 For those who are interested, another way of getting the original text of the Lone Pine books – other than buying the early editions second hand – is to buy them from Girls Gone By Publishers, who are planning to bring out the entire series. They are also doing the Chalet School series by Elinor M. Brent-Dyer for all the nostalgic women out there. They are in paperback, but with the original text and nicely produced; I haven’t spotted any typos yet. On the subject of typos, I felt moved to write to the publishers of a new edition of Ballet Shoes for Anna which was riddled with really bad mistakes. Somebody replied to me and they did eventually reissue it with fewer typos. (How come there are so many? Aren’t there more than there used to be? Or am I just getting older??) But did I get a free copy for my pains? No. 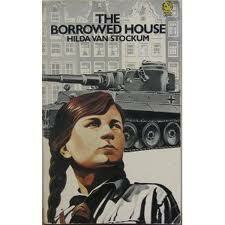 Other favourites from when I was small include The borrowed house by Hilda van Stockum, The house at world’s end by Monica Edwards, Tales of the Greek heroes and The tale of Troy by Roger Green.